The 17th annual Holiday Bike Drive is right around the corner, and what better way to celebrate than a party at the bike shop? 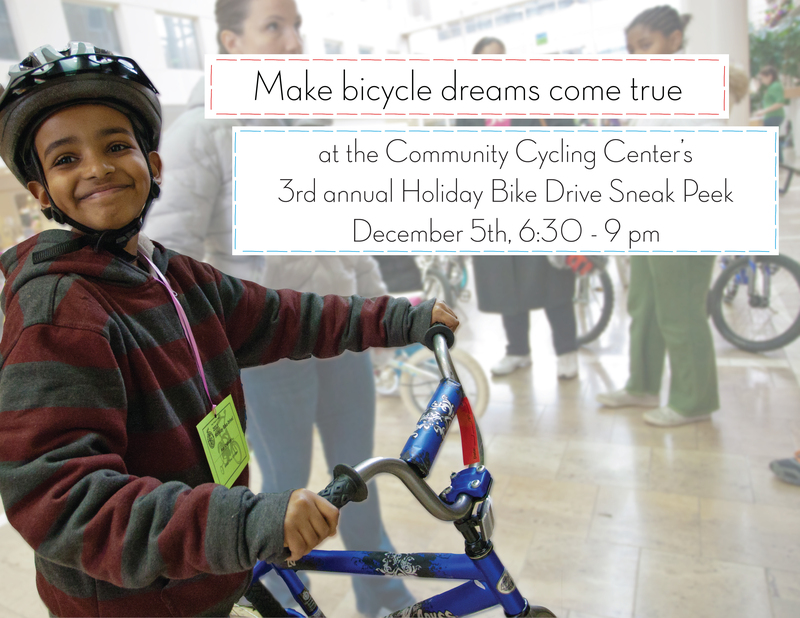 Join us on Wednesday, December 5th, from 6:30-9pm at our bike shop for the 3rd annual Holiday Bike Drive Sneak Peek. – Enjoy beer, wine, snacks, and music. – Take advantage of great deals on cycling gift packs. – Share stories of Holiday Bike Drives past and learn about what’s in store for this year’s big event! – Bring a bike or your checkbook to make a donation and help make bicycle dreams come true. Bonus! This year we’re offering a sweet door prize – make sure to enter to win an “Alberta Personal Day” gift pack that includes a deluxe bike detail. RSVP on our Facebook event page and bring your friends! Where: Community Cycling Center, 1700 NE Alberta St.
Can’t make it to the event but want to support us during our year-end fundraising campaign? It only takes a second to make a donation online!